January snow drifts over the back lawn and the driveway’s a shoveled trench. North winds whip under the door leaving ice mice against the rolled rug. I’m longing to curl up with a mug of hot cocoa, buttered toast, blanketed on the couch next to my books. But, alas, we’re trying to eat less and lighter after the holiday indulgences. Not such fun when heavy winter stews tempt. Yet a zing of spice will lift even the simplest broth, so I’m calling on chilies to bring a wisp of sun back into the kitchen. 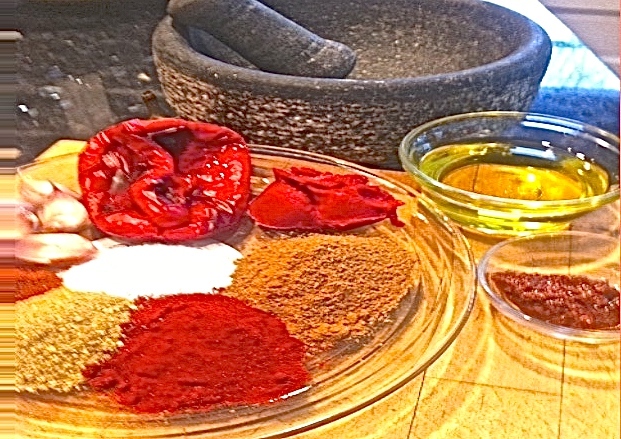 A recent reading of Einat Admony’s cookbook Balaboosta reminded me of the Tunisian hot sauce harissa and I went straight for my mortar and pestle. Here’s the winter pick up I needed: a zippy sauce that transforms a bowl of beans and rice, spreads on toast and enlivens a soft baked potato. Olive oil binds the spices, mellows the cayenne. The generous lacing of fresh garlic and roasted pepper gives the sauce a creamy smoothness. All the ingredients are easily found, and the finished sauce keeps for weeks in the fridge or may be frozen. I chose to roast and and grind my own coriander, cumin and to blend all the ingredients in a mortar for pleasure. But a food processor and pre-ground spices work equally well. Let it snow—I’ve got harissa to brighten my lunch. *Roast the pepper whenever you bake bread or use a hot oven. Once it is soft, place in a small covered saucepan to steam; once cool, the skin will slip off and the seeds fall out. Jarred, roasted pepper could be substituted. **This amount of cayenne makes a spicy but gentle sauce. Up the ante for more fire. If using a mortar, crush the garlic to a paste with the salt. Add diced roasted pepper and mash together. Tip in the dry ground spices and blend to a dense paste. Gradually work in the oil to make a smooth, thick sauce. Store harissa in a clean jam or mustard jar. Makes a generous cup. You are currently browsing the Mary Jo's Kitchen blog archives for January, 2014.